Boat: Twin 350 Chev engines with approx. 200 hrs. New fuel and hot water tanks, new head and holding tank. Boathouse kept since new. Boathouse: 36’ x 16’ Boathouse with new curtain. Must be member of Day Island Yacht Club to purchase boathouse. 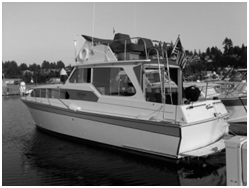 Price: Boat and boathouse package $53,500 or will sell separately, but boat must sell first.